Ideally, you will have to click (and click) to open Control Panel to change the default audio device. If you often change the audio device, how about doing it quickly from the system tray? 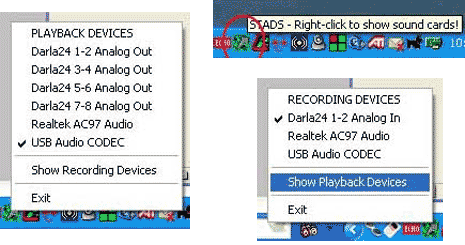 STADS (System Tray Audio Device Switcher) is a free program that allows you to toggle and switch the audio device from an icon on the system tray. 1. Download STADS program and run it. 2. STADS icon will appear on the system tray. 3. Right click that icon for list of audio playback devices installed on PC. 4. Click any audio device that you want to use. 5. Click Show Recording Devices to see recording devices installed on PC. 6. Click to select any listed recording device. 7. Use exit option to turn OFF this program. STADS for sure can make techno life easy while dealing with selection of either of audio devices at different times while using the computer. No need to perform long and boring control panel access routine to change audio device. I found STADS and VistaAudioChanger wasn’t working with my copy of w7. It does work fine. Perhaps you were too quick to read the simple instructions. It’s not a screenscraper – i’m not sure what you mean by that. It does act work in the same way as macros but alters them on the fly to suit the situation. MS don’t want to allow software to alter the default audio outputs directly so firing off macros is the only favourable way of doing it.